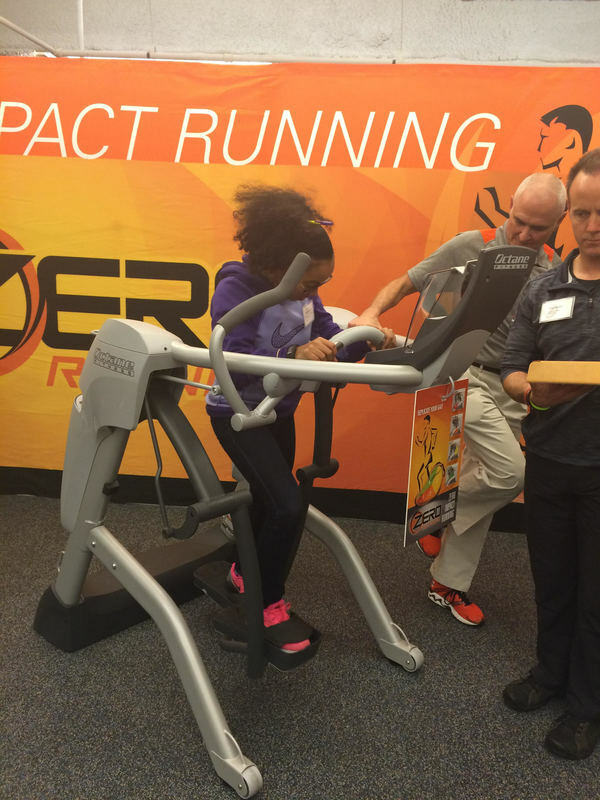 Octane Fitness has developed a totally unique machine – the Zero Runner – that will change the way runners train. It allows you to run with zero impact on your joints and I had the pleasure to be invited to check it out. If you really know me, you know I was completely STOKED to find out more about this running machine. Although the Zero Runner is similar to a elliptical and very comparable, there are key differences that make it one of a kind. It’s bionic legs have hip and knee joints that allow the runner to have freedom to run with no weight on their knees. 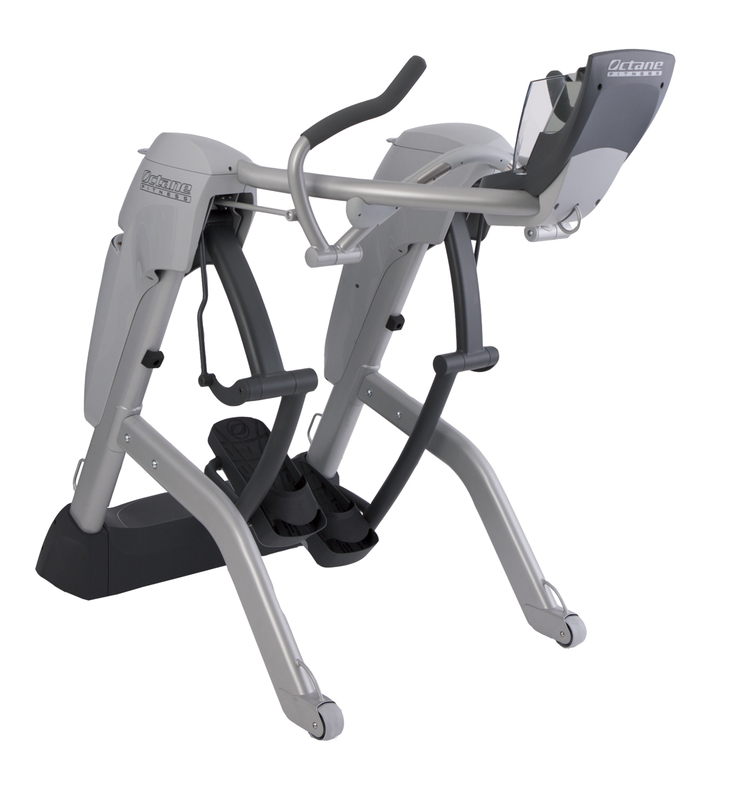 An elliptical only allows the swinging motion back and fourth while the legs on the Zero Runner allow the runner to have the full form and follow through as if they’re really running. The Zero Runner focuses on movements and allows you to mimic real running with the same benefits as if you’re running outside without the pounding on your knees. Because of this you will feel better and be able to avoid so many injuries. You will also be able to prepare for races so much better because combinations of miles on the road and on the Zero Runner will assist with maximizing stamina and reducing stress. Active recovery runs on the Zero Runner will be so much more effective because you are not pounding on previously fatigued muscles which many runners do when they go for recovery runs outside. We were also fortunate enough to hear from two wonderful speakers at the event, too. 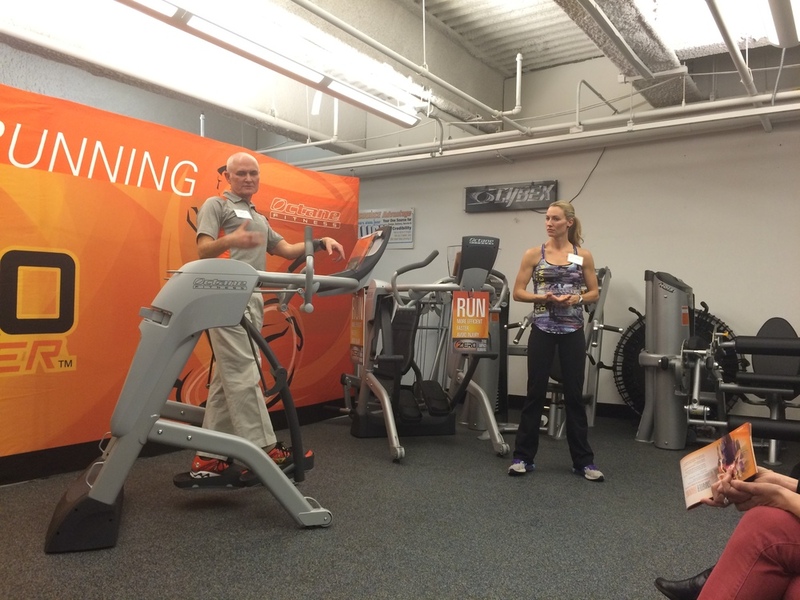 Olympian Carrie Tollefson and Running Specialist Larry Schmidt told all about their careers in running and their experiences with the Zero Runner. Carrie Tollefson has done her share of running since her high school days where she was a 13 time state champion, through her college career at Villanova University where she was a 5-time NCAA champion and so much more. Though this may sound fabulous, the journey through it has been one with many injuries including 3 surgeries for sport hernias, stress fractures in her feet and pubic bone, AND plantar fasciitis in both feet. This resulted in her not being able to stay competitive. Now, if that doesn’t sound like hell, I don’t know what does. She said if only the Zero Runner was around in her competitive days, she could have lasted much longer and would have been able to avoid such injuries. Larry Schmidt has also had his share of pain and gain in the running game. He’s completed 83 marathons, 17 ultra marathons (3 of which were 100 mile runs), and 6 ironman triathlons. I think his real name is Super Man, because that background is just INSANE. After all these years of running it started to take a toll on his body and he suffered from hip issues and Osteoarthritis. The Zero Runner was a godsend that allowed him to run for a whopping pain free 5.5 hours (33 miles). So far he’s totaled 617 miles on the Zero Runner and is elated that it’s given him the chance to not only run again, but also a chance to run with his children and his wife, side by side. “I can’t stress the importance of a running machine without impact” – Larry S.
Of course, I had the pleasure of trying it out for myself. Larry helped me get an idea of how the body is supposed to move to control the legs (since they are not powered, you move them yourself!). Once you get a rhythm it is pretty easy to pick it up, I did within 30 seconds, and he assured me that it would be the same for just about everyone. It’s also pretty amazing how QUIET this machine is. It’s cordless and only requires 4 AA batteries. Super plus, being that it is a consumer item that’s meant for the home – it is definitely home friendly. If you’ve got little ones running around, you can still get your runs in without waking them up. CROSS CiRCUIT (in the Smart Link app) is a program on the Zero Runner that allows you to implement strength and flexibility training into your running workouts. It has videos and exercises to help you target your weakest links for improvement. The Smart Link app is also capable of wirelessly connecting to your mobile device to display all of your running stats. Get your training in right on the Zero Runner – as it comes equipped with resistance bands and seven connection points on the front so you can efficiently cross train. So who is the Zero Runner really targeted to? Almost everyone. Regular exercisers, aspiring runners, running addicts (me! ), injured runners, aging runners and more. The Zero Runner also offers gait tracing – in case you’re just starting out and your form is not the most pristine. The point of this feature is to improve your stride and ensure that the runner is strong in mile 5 as they were in mile 1 which applies to all runners. Most runners forms tend to be affected once they start to lose strength and become fatigued, and this feature will assist with keeping that in check. The Octane Fitness Zero Runner is something quite like no other and will change the way runners train. You are provided with realistic runs as if you are outside. Using the Zero runner will allow runners to train safely in order to become a faster, stronger runner that can run much longer. It perfects your form, allows for active recovery, and has NO impact on the joints which will allow runners to last much longer on the running scene. It will cost you $3299.00, and will be worth every dollar spent. I know what I’m asking Santa for! Keep Up With Octane Fitness!